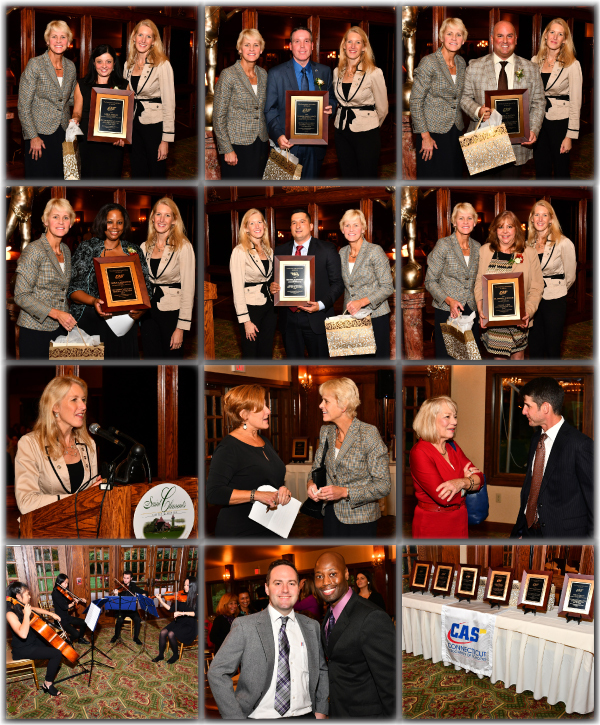 On Thursday, October 26, 2017, CAS hosted its annual celebration of educational leadership at Saint Clements Castle in Portland. The event was conceived seventeen years ago following a resolution by the CAS Board of Directors to find ways to recognize and pay tribute to individual school leaders as well as to promote the profession of school administration. More than one hundred twenty educators, friends, and family members packed the Waterford Ballroom at Saint Clements to join in honoring CAS’ 2017 Distinguished Administrators. Guests were greeted at the door with the stirring sounds of the Glastonbury High School Resident String Quartet directed by Nola Campbell. Donna Hayward, principal of Haddam-Killingworth High School and chair of the committee which organized the event, warmly welcomed guests and praised the accomplishments of the six honorees. “In the midst of declining resources, accountability pressures and the myriad demands of your profession, you continue to bring innovation, inspiration and dignity to the work of educating our children,” said Donna. CAS Executive Director Dr. Karissa Niehoff extended warm and spirited congratulations on behalf of CAS and its members. Dr. Niehoff praised the honorees for their “conspicuous excellence.” Said Dr. Niehoff, “Your excellence has been made conspicuous through your work in the very complex world of school leadership. You are both administrative directors of state educational policy and building managers; you are both advocates for school change and the protectors of bureaucratic stability…Each of you, through your excellence in leadership, have demonstrated unwavering commitment to doing what is right and good for kids and for your colleagues. You have invested your time and energies above and beyond what is expected of school leaders; demands which, arguably, have never been greater. And in your efforts you have touched the hearts and engaged the minds of so many people- especially children. Read her energetic and uplifting remarks in their entirety. Following the welcoming speeches, each of the six distinguished administrators was entertained with a short slideshow containing pictures and quotes from friends and colleagues. All honorees received a plaque, a book and, thanks to the generosity of Jostens, a custom-designed ring to commemorate their achievement. Many thanks to our official photographer, Grynn & Barrett Studios.